Peoplestown Residents Stand Against Their Displacement, Will You Have Their Backs? The picture above is the view from my kitchen window last week as the 3 houses next door to me were torn down by City of Atlanta bulldozers. To the City these were simply parcels in the way of their plans to build a park and pond. To me these were homes filled with families, with whom I had relationships and I miss them. 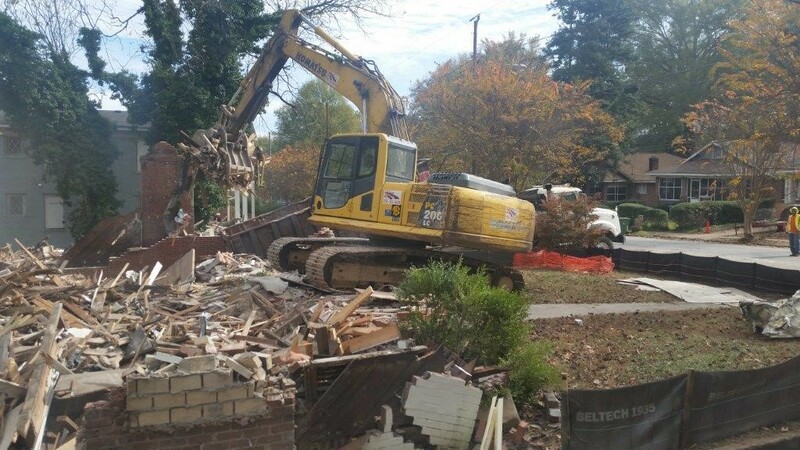 Despite the City of Atlanta's misrepresentations, THESE HOMES DID NOT FLOOD, and that makes the loss that much more profound. My remaining neighbors and I are determined that our homes and families will not meet the same fate. WE SHALL NOT BE MOVED!! 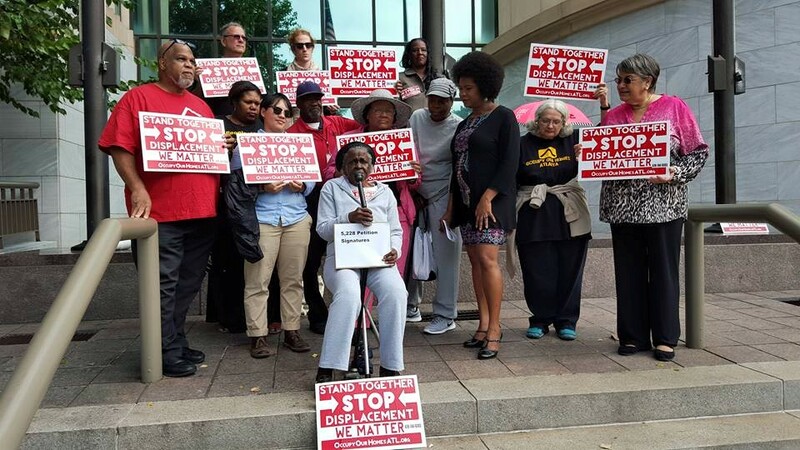 Weeks of media pressure, sit ins, press conferences and rallies inspired the Mayor to decide that our neighbor Ms. Mattie Jackson (93) will stay in her home. He said the City's plan would be worked around her house. We are delighted for Ms. Mattie and we are meeting with the Mayor to demand the same treatment. We demand that the Mayor DO THE RIGHT THING! Thank you in advance for your support. Together we can make the difference!! Please mark Tuesday Dec. 1 on your calendar and circulate theevent and the enclosed Face Book event post https://www.facebook.com/events/1644760795812832/widely and encourage others to stand with us at 9:30 a.m. on Dec. 1 on the Trinity side of City Hall (55 Trinity Street) or make a call on our behalf. Phone Script for Call to Mayor's Office (404.330.6100) on Monday Nov. 30 and/or Tuesday Dec. 1 from 9:30 a.m. - 1 p.m.
My name is ____________ and I am calling in support of the Peoplestown residents who are meeting with Mayor Kasim Reed to demand that they remain in their homes. I want the Mayor to do the right thing and allow them stay in their homes just like he decided that Ms. Jackson can stay in her home. Thank you! 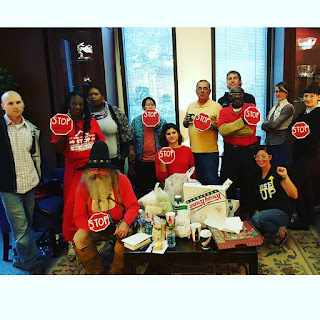 Today the remaining residents of Peoplestown descended upon City Hall and the Mayor's office to demand the meeting he promised them weeks ago. A group of 50 people held a sit-in at the Mayor's office until his Chief of Staff scheduled a meeting with James and Bertha Darden and Tanya Washington, whose homes bookend the block that the Department of Watershed has slated for demolition to build a park and pond. After holding a spirited press conference on the steps of city hall and then a three hour sit-in the Mayor office finally agreed to a meeting with terms the residents were happy with. The meetings are scheduled for Tuesday December 1 at 10:30 and 11:00 a.m. The Mayor's office has agreed to direct the Department of Watershed to refrain from threatening the residents with legal action until the meeting takes place. The residents are grateful that they will be able to enjoy the Thanksgiving holidays without fearing being pushed out of their homes. They are looking forward to a meeting with the Mayor focused on their demand that the City's plan accommodate their homes and that they, like their neighbor Ms. Mattie Jackson, be permitted to remain in a community they love and helped build. Today's bold resident led action is a reminder that regular everyday people can stand up against gentrification and mass displacement. At American Friends Service Committee we believe that communities should be controlled by those that live in them, not developers or other entities in search of new profit streams. Today is a small victory in a much broader fight. 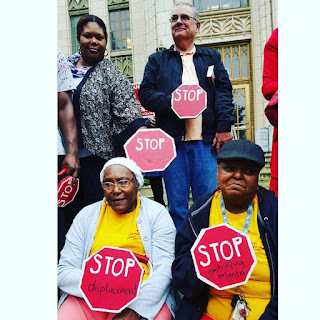 On Wednesday 11/4/15 at 10am Peoplestown residents will hold a very brief press conference on the steps of city hall (68 Mitchell st) before heading to the Mayor’s office to hold a sit-in. Residents plan to hold the space until the Mayor agrees to meet with them concerning their homes and their desire to not be displaced from a community they helped build. 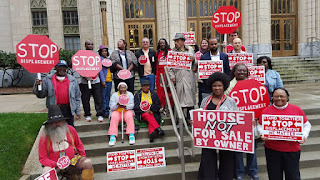 "When the Mayor decided Ms. Mattie's home can stay, he acknowledged that flooding in Peoplestown can be addressed without demolishing an entire block in Peoplestown", stated homeowner Tanya Washington, whose home is one of the homes slated to be demolished. The remaining residents whose homes bookend the block are requesting that the Mayor direct the Department of Watershed to amend the plan so they can also stay in their homes. 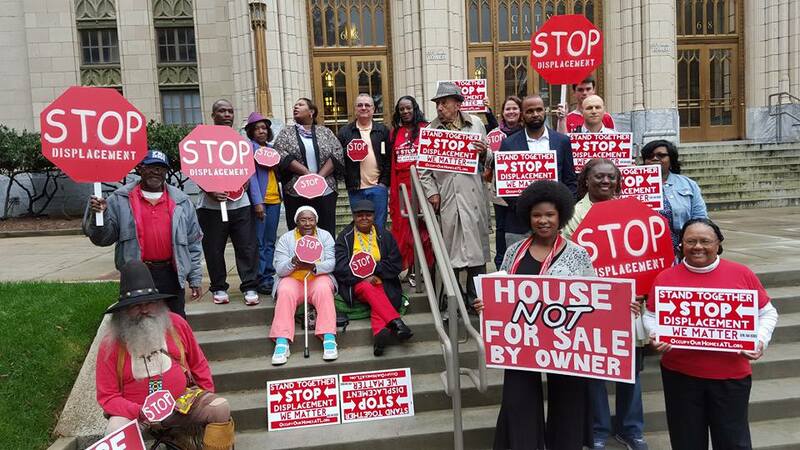 Last week, the residents and their supporters held a rally and camped out all night on the steps of City Hall to emphasize the point that if Ms. Mattie stays they stay. After holding a 10am press conference this morning they presented a letter to the Mayor, supported by a petition with 5395 signatures, respectfully requesting that he meet with them to address their right to also stay in their homes. 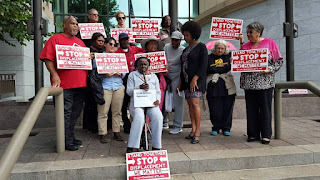 Ms Mattie joined them in solidarity and told her City Council Representative, Carla Smith, that she wants her neighbors to be treated as fairly as she's been treated. The Mayor's office refused to even schedule a meeting with the residents, who had camped out all night in anticipation of getting some word from the mayor’s office about their homes. The residents and their supporters plan to return to the Mayor to demand the meeting which he promised. "We've been here going on 30 years, we've raised our children and our grandchildren here. This is our home and we have no intention of leaving", state Bertha Darden who lives in one of the homes in question with her husband Robert Darden. We are of course disappointed with Mayor Reed's continued dismissive stance towards these Peoplestown residents but we remain hopeful that he will do right by them as he did right by Mattie.